Today I'm opening a new section that I have been brooding at length before deciding to expose it to the world, as if it were a fragile son that somehow needed protection: I thought I'd call this section "Was and Roundabouts" as I intend to treat of those books telling about war, about the absurdity that pushes men to commit unjustified and inexcusable crimes, and of all that gravitates around those themes. I am inaugurating this section with a character I very much loved when I was a teen. As a teenager I wasn't a big reader, but I remember reading her diary several times. With Anne and Kitty I lived the emotions of a kid that had to grow up to soon because of the external world, as I have been as well even if for completely different reasons, I recognized myself in that vital fervor, in that élan that permeates all of Anne Frank's diary. In those pages I identified all the difficulties and the fears common to teenagers, made even harsher by confinement and by the fear of being discovered: the fervent empathy I felt made me feel the same dread, the same hatred towards adults who never understood how fragile feelings can be, the same beats, and I desperately writhed my hands. I have been in Amsterdam several times but, I must confess, I never had the courage to visit the house in which Anne lived her months of self-imposed imprisonment: that distant and dusty place had lived in me for too long and I was afraid that all the emotions I had felt would suddenly vanish if I visited it, as if reality could break into the imaginary I had lulled and endured for such a long time without hesitations. Too many things have been said and written about Anne Frank, or maybe it's never enough. 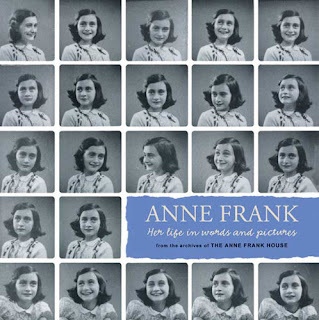 Last September a new, wonderful, book was published with the title: "Anne Frank, her life in words and pictures", by Menno Metselaar and Ruud Van der Rol, translated into English by Arnold J. Pomerans for Flash Point Publishing, made in collaboration with The Anne Frank House. As the subtitle partly explains, in this book the authors are treating of the Frank's lives up to their capture, through images and words. This book is for young readers, aged 9 to 12. Anne Frank is, always, an incredibly strong symbolic character because she embodies the power of life, with the contrasts and the innocence typical of adolescence, because she is a victim of that same brutality that keeps victimizing all those kids who can't allow themselves the luxury to live their childhood, because those terrible facts, that aren't just history, keep happening every day and we look at them without feeling concerned. I believe that making her known, with new books as well, is a beautiful message for those kids that have many advantages, and to those parents who tend to forget it. I'm saying this without demagogies, with no hidden purposes, because I feel that getting back in contact with the many truths of the world could be nothing but good for everyone. In the dairy it's Anne speaking, with no mediations, without limitations of any kind: the girl, almost adolescent, who opens her heart to an imaginary friend, Kitty, and to all those girls and boys of the same age willing to read her letters and to find those same condition and feelings. "Anne Frank, her life in words and pictures" will never substitute that unique experience, of course, but it allows lazier readers to still take advantage of an important experience.